Karan Madhok, Wuhan, China: A day ago, India’s basketball Head Coach Scott Flemming, troubled by India’s lack of any exposure games in the run-up to the 5th FIBA Asia Cup in Wuhan (China), had lamented that the team would have to learn the way it plays on the fly. On Saturday, in their opening encounter against Japan, Flemming’s solemn premonition held true: nervous from the start, India failed to stamp its identity through large courses of the game as Japan recovered from a slow start to blow India out, 75-52. India’s first game was marred by turnovers from the start, as India gave away several easy opportunities to their opponents. India committed 23 turnovers, and Japan were only happy to make the most of easy fastbreak points. While India started the game off well enough on the defensive end, they struggled to keep up the same intensity after the first quarter. India were down by just two points to Japan when the first 10 minutes were up, but Japan started to exploit India’s defensive weaknesses in the perimeter to hit multiple open threes, while India failed to convert their open shots on the other end. It was in the second quarter that Japan’s superstar and the tallest player on court – Joji Takeuchi – took over. Takeuchi was unstoppable as he dominated the post and finished the game with 13 points and nine rebounds in limited but highly effective minutes. With the result of the game all but decided, India began to play some positive basketball in the final period. Amrit Pal Singh started to convert the opportunities inside that India had been missing earlier to finish with a game-high 15 points along with eight rebounds. Coach Scott Flemming rotated all 12 of his players regularly to give them all exposure and experience, and helped them get a feel of the game before the game ended. A major positive that India can take away from this game is that, despite the 23 point loss, India outrebounded their opponents 36-31, showing immense hustle but lacking the ability to cap off their hard work with results. For India, getting that little bit of experience down to the last player and staying optimistic about all the positives will be essential, as things won’t get any easier for them looking ahead. India has their next game tomorrow (Sunday) against the hosts and one of the tournament’s favourites, China. China won their first game on Friday against Indonesia 105-37 and will be hearing the home crowd’s support with every ebb and flow of the game. Coach Flemming spoke to Ekalavyas in an exclusive after the game, and discussed how the team could be more competent in their next game against China. Japan 75 India 52. Despite some stretches of good defense, India couldn’t defend Japan from the perimeter and committed too many turnovers throughout the course of the game. India will have their work cut out for them tomorrow against hosts and China, who are one of the tournament’s favourites. Hopefully we see an improved effort, at least. See you all tomorrow! After this opening loss, India will find tomorrow’s match even tougher, as it takes on the formidable hosts China at 5:00 pm IST. As difficult as it may be, India needs to forget about today and simply play better tomorrow. Look forward to having you guys tomorrow evening as well for India vs China, when the world’s two most populous nations lock horns. No Hindi-Chini Bhai Bhai tomorrow for sure! The one statistic where India has enjoyed the advantage in this otherwise forgettable game is rebounding, India has 36 boards (combined from both ends of the floor) compared to Japan’s 31. This will make no difference to the outcome though, as Japan will surely win this game by at least a 20 point margin. Palpreet Singh Brar scores from the outside, and comes back on the very next position to attack the basket, earning two fouls. He misses the first, scores the second. Japan can now just run the clock down to ensure the victory. Amrit Pal Singh continues to play hard till the end. He now has 15 points – leading both teams in points. Jiju Takeuchi, Japan’s star, has been on the bench for a while. India also has only 7 team assists so far as compared to 15 for Japan. It surely shows the the Indian half court offense isn’t settled into the right positions and not moving the ball well. That can’t be a good sign. Let’s hope this is just a case of first match jitters. Fourth quarter, and Coach Flemming continues to rotate the players a lot. India is down 62-39 and it’s probably more important now to get as many players game-time experience together as possible for the next games. Not that it would’ve changed the result, but India playing with a hurt Joginder Singh was a factor. He’s India’s starting PG and knows Flemming’s system well. The ankle injury limited his minutes today. Grewal follows it up with an airball from the three-point line on the other corner. Fourth quarter begins with India down 60-34. Narender Grewal gives India something to cheer about with a three-pointer to open up the period. India has played all 12 of its players in a bid to find the right combination and get India back into this match. India trails by 26 points with 10 mins of game left. Hope it can mount a comeback just like Japan did against India last year. If there ever is a chance to pay them back by the same coin, it is now! Palpreet Singh – who starred for India at the U18 FIBA ABC in Mongolia a couple of years ago – is getting some burn. He’s a big man with a decent jumpshot, but is moving very awkwardly on court. India has turned over the ball as many as 20 times as compared to 9 times by Japan. At least the cheers are going for India! The Chinese home crowd is backing India with every nice play and made shot. Unfortunately, there haven’t been too many in this third quarter. This should’ve been a closer game for India, really. An encouraging start, but Japan is looking very fluid right now. Joji hustles India over for another offensive rebound. That’s the third three for Japan in the period, this one by Okada. 26 point lead. Japan are looking like a completely different team offensively, and India have no answer for their outside shooting. Japan has now taken a 55-32 lead. India sure doesn’t seem to have learnt any lessons from last edition’s FIBA Asia Champioship, despite repeating many players from last year. It’s really unfortunate that the pre-tournament exposure games got cancelled. Playing warm up games could have made a world of a difference in preventing many of our first half mistakes! Japan score the first five points of the second half and this game is getting out of hand. Japan now has a 19 point lead. 2. Be more patient offensively to make careful passes, but still be quick enough so Japan’s defense doesn’t get too much time to set up. 3. Find a way to limit the easy opportunities that Joji Takeuchi (13 points) is getting. He’ll get his points anyways, but India has to make it tough for him to get the ball in easy positions. India is still clearly very nervous and several silly mistakes showed that. Down 14 and facing an opening loss, does India have enough to make a big comeback in the second half? Pic: National Anthem plays for India. Pic: Team India warms up before the game. The three players in the middle are Riken Pethani, Prasanna Venkatesh and Vishesh Bhriguvanshi. More signs of nerves from India, as they miss a lot of easy looks. Rikin Pethani finally converts an offensive board. Still a neck to neck game. We’re lucky that Japan isn’t playing their best game either – they pushed Asia champions Iran to the brink before a close loss yesterday. Awful passing by India – and they are all to be blamed at this point. Game is still close because of India’s work at the defensive end. But offensively, India has to make the passing crisper. Jump shot by Jojo Takeuchi, Japan’s biggest player, gives Japan a 5 point lead. On the other end, Vishesh Bhriguvanshi calmly sinks two free throws to make it a 3 point game again. Amjyot Singh and Amrit Pal Singh are exceptionally skilled with their back to the basket, but both are slightly slow in the post. A little more fine tuning will make both of them unstoppable. Amjyot has a decent outside shot too. A year ago, India played vs. Japan at the FIBA Asia Championship in Manila, and were neck to neck for 36 of the 40 minutes, so close to pulling a big upset. Will we finally complete that upset this year? The first quarter ends with Japan holding a 15-13 lead. India has played great defense but has been nervous on the offensive end. Still, a couple of big threes have kept India in the game so far. Careless turnovers by India. They are very determined on defense but nervous offensively. Timeout called. Coach Scott Flemming told me yesterday that this team hasnt played together in practice games at all so will be learning as they go in today’s game. Seems to be that ‘learning’ phase right now. Still, the defensive effort is encouraging. Japan are sure to respond strongly after this timeout. Don’t think Japan were expecting India to play such frantic defense. India steals the ball again, and Japan is stuck on 6. But on the other end, India’s offense is sputtering too. Japan finally make it 8-6 behind a layup by Tanaka. Both teams going through an offensive drought, and neither has been able to put points up on the board for several possessions. Amrit Pal Singh comes in with two strong plays at both ends of the floor. A hook shot and then nice defense to cause a Japan miss. Japan getting to the basket easy but couldn’t finish it. Yadwinder Singh loses the ball on the other end, handing it right back. Another turnover, as there’s an offensive foul on Japan’s Takumi. I’m getting chills at ‘Jana Gana Mana’ plays before tip off! Team India warms up pre-game. T-minus 15 minutes. Team India is a bit of a mystery to most of the other mediapersons attended here. 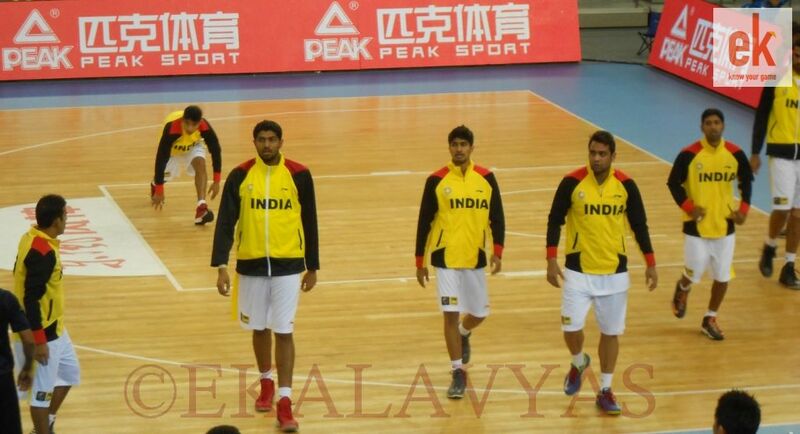 But many people are indeed impressed by the size of this team – Amrit Pal Singh, Amjyot Singh, Palpreet Singh, and Rikin Shantilal are all 6-foot 8 or taller. Hi everyone! 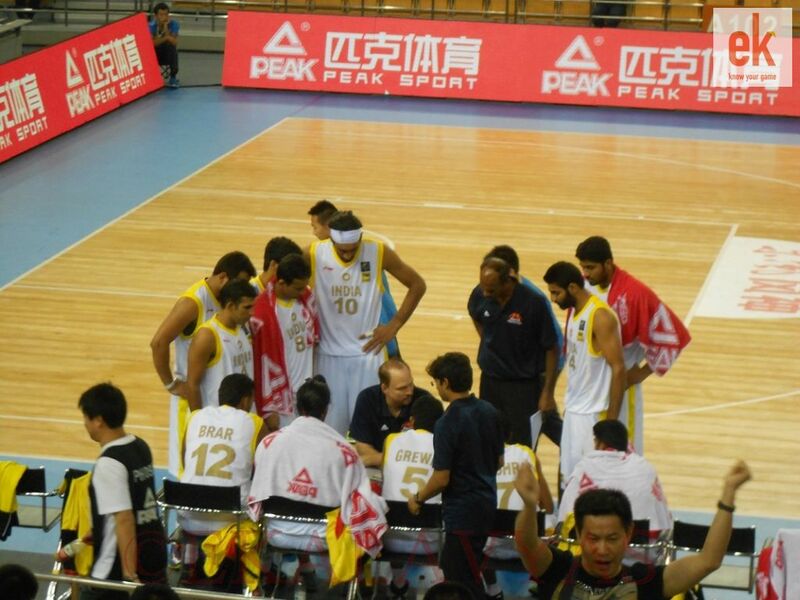 This is Karan Madhok checking in from the Wuhan Sports Center from Wuhan, China for the 5th FIBA Asia Cup. India’s first game of the tournament against Japan is set to tip off in less than an hour. I will be bringing you live commentary from the venue as the action unfolds!